Corydoras species Personal opinions for leisure, not to be taken as advice. Continue reading only if you agree that I am not liable for any advise, injuries, losses or errors. 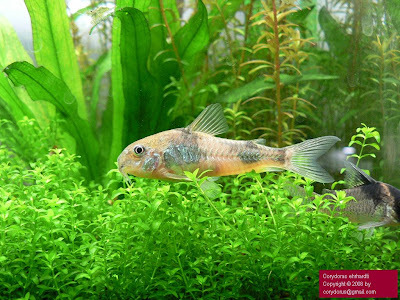 Corydoras ehrhardti belongs to the Corydoradinae sub-family of the Callichthyidae family. When she was found in LFS Da Lung Street, Taipei, she was already a sole fish in the tank already. However she is extremely healthy. Perfect fins, actively swimming and survived the stressful journey from her homeland, she is likely to be stronger after. The only regret is that i could not purchase more as she is in excellent condition and beauty. Often in the internet, people commented that she looks like C. paleatus, a common grey species which I feel do a great de-service to this poor species rarely found in the market. Her elongated sturdy body, shiny greyish-green camouflage with clean-cut patches and hyper-activeness will instantly be recognised by any hobbyist in her own rights, a separate and beautifully unique. She is still alive and kicking in various eco setup that i designed for my tank depending on my mood for the past 3.5 years. 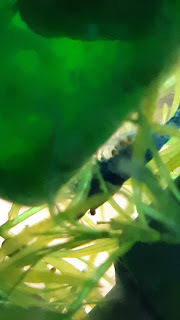 And she is also the typical stronger ones who is able to swim to the surface to suckle the terta bits flooding on the surface, for a period of time. When she does this, you will hear the "Chip" Chip" sounds made by the inhaling of water and air in the night. The above is a rare photo where i manage to get enough light at the right location and her staying motionless for the few seconds to snap. Mess up with my water PH recently. Put too much shells and removed the large driftwood. Now she is swimming listlessly for the past week. Feel like she is nearing her ends. Just to come in to say she passed away .... found her decomposed body tuck underneath a log.